If you like interior design you have probably noticed that nearly every picture of a nice living room, a bookshelf, or a dining table has a pot of fresh flowers in it. Flowers add liveliness and color to any room. You can even put them on bedside tables and bathroom counters. I usually get flowers for the home when there’s a special occasion, but every now and then I buy inexpensive supermarket flowers just because. Flower arrangements give a touch of glamour I just can’t resist. The good news is that they don’t have to be expensive to look good. Not everybody has a good florist around the corner or the budget to have weekly fresh flowers delivered a-la Elton John. Following a few easy principles you can give that high end touch to your house using supermarket flowers. For example, the photo in the cover is a bouquet I made with 3 bunches at $4.50 each. Two dahlias in different shades of purple, and one bunch of white chrysanthemum. Here’s a few tips to bring some flower power to your house. 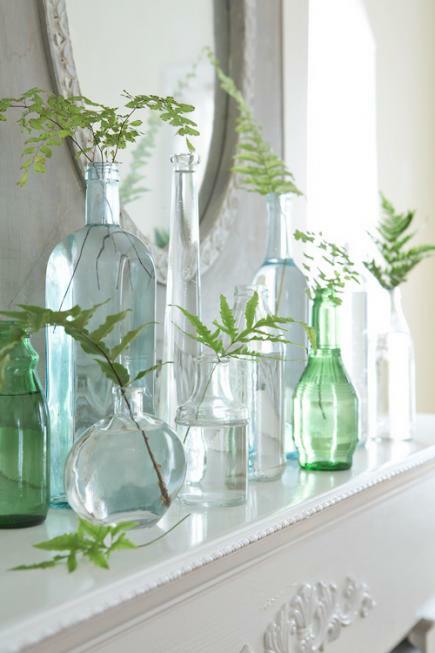 1- Keep a small collection of glass vases. Use an assortment of your own water glasses, tea cups or mugs for example. Some mineral water brands have beautiful bottles you can keep for this purpose, or you can get economical packs of simple vases in IKEA. If you spread flowers among many vases it also creates a beautiful composition. They KEY here is to trim the stems very neatly to create a clean look. Spring decorating by Midwestliving.com with ferns instead of flowers. You can pick anything from your back yard for this. 2- Go vintage, like an English Cottage. An old water jar, a wooden bucket, a tin or a Harney & Sons tea can, make a wonderful flower arrangement too. If the flowers are not so fabulous, the arrangement will stand out with an original vase. You can take a multi flower bouquet and separate the flowers for different rooms or spaces. Even the leaves can be used in separate vases like the example above. Try to pick smaller single flower packs instead of ready made bouquets. They are cheaper and easier to play with. For example 3 different flowers in the same color, two packs of two colors (white and yellow, yellow and orange, pink and purple…) or 3 shades of the same color. Make a few flowers really stand out when they are lose in a big vase. Or go to the other extreme and fill the vase with lots of flowers of the same type making it very crowded. This works for big or small vases, so it all depends on your mood and your budget. Baby’s breath an affordable and easy to find flower. You can also skip the water and let them dry. They will last forever. White chrysanthemum (2 packs of $4.50) in a large vase from IKEA and voila! For the minimal look you can take inspiration from two different regions, Japan and Scandinavia. If you trim the stems every other day and change the water frequently they can last a whole week, and then you can make another arrangement for the following week. If one flower is getting a little stale and spoils the composition you can move to another room by itself while it lasts, to make the most of the investment. Now you know what to do next time you go to the supermarket. Put those flowers to your trolley and enjoy the flower arranging! Brazilian waxing, yay or nay?